Sun Zoom Spark - "In Stereo"
Originally called The Red Planets and based in Madison, Wisconsin, Sun Zoom Spark (named after a Captain Beefheart song) eventually relocated to Tucson, Arizona where they have recorded three CD's and a rock opera to accompany an upcoming film. The band consists of Eric Johnson on guitar, moog, Rhodes, drums, bass and vocals, Bryan Kohl on drums, Steve Goetz on bass, and Duane Norman on saxophone, flute and clarinet. What first brought Sun Zoom Spark to my attention was the involvement of Johnson and Kohl (aka Otto Terrorist) as part of the backing band for the latest incarnation of Black Sun Ensemble (see AI #19). About half the songs on the album are heavy rockers with a 70's feel that I enjoyed. "Almost Every Day" opens the set and is a Bluesy rocker that brings to mind Foghat, complete with Lonesome Dave styled vocals. "Ugly Brain" is a thudding dirty rocker with a little bit of a Stoner feel. I really dig the guitars on this tune. No shredding... just a great rockin' sound. "Goodnight" is a solid grinding rocker that was a highlight for me. And "Food For The Soul" has a thrashy garage rock feel that I liked a lot. But there's a lighter side to the band that didn't grab me as much. Slower paced songs that are well written and played but don't go off into territory that I found particularly exciting. There certainly are interesting moments like the cool freaky synths that give a bit of spacey embellishment to "Shiney Side". And "Passing Planes" includes lots of changes in pace and part of it reminded me of an old Lou Reed song (can't put my finger on the title). But the one slower song that I did quite enjoy is "Old Car Blues", which has a bit of a trippy folk-psych feel, mostly from the dreamy flute and guitars, and the music is also given a cosmic kick by a spacey synth weaving it's way throughout. And finally... well... Sun Zoom Spark clearly have a variety of interests which they put on full display for the closing 15 minute track, "Masterpiece By Midnight". The first 9 minutes consist of a killer space-psych freakout jam. We're talking classic old time acid psychedelia with a rolling bass and spaced out synths, all dominated by ripping AcidFuzzWah guitar. And there's some hidden goodies too. First there's a voice introducing the band in French. After some silence we get another song with a dancey Beat styled electronic groove and more cool psych guitar. An excellent tune and quite different from the bulk of the album. 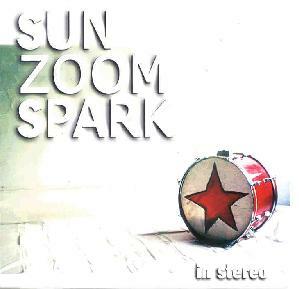 In summary, Sun Zoom Spark are an excellent rock band though I enjoyed their heavier tunes the most, which they clearly excel at given some of the tunes on this album, not to mention the power of their contributions to the latest Black Sun Ensemble disc. There are two previous CD's so I'll have to check those out to see how they compare. For more information you can email Slowburn Records at: slowburnrecords@aol.com.